Mr McKay speaking at the 7-Eleven business update. 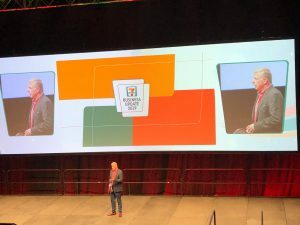 7-Eleven held their annual business update in the Margaret Court Arena in Melbourne. During the event, 7-Eleven Australia CEO Angus McKay spoke to the attendees (a mix of suppliers and 7-Eleven staff) and gave an update on the business. Mr McKay said he wanted to focus on business performance and strategic direction. “From a store perspective…by the end of this fiscal year, we will hit the magic 700 stores across our network,” he said. Mr McKay said there was the vision to expand the store reach in two parts: “One, is we’re expanding where the population is going…we’re also turning our sites to how we think about infill development”. “How do we make sure we have a store that is convenient for customers who are looking for that particular solution? “There are no plans for us to slow down, 7-Eleven needs to keep expanding. Mr McKay said the companies competitors were driving them to be better and faster, as the landscape is changing. “We are the largest independent fuel operator in the country and we have a great value parter with Mobil,” Mr McKay said. Following the business update, guests were invited to peruse and learn at the innovation showcase, followed by a lunch and an award ceremony to recognise the hardworking partners and team members of 7-Eleven.